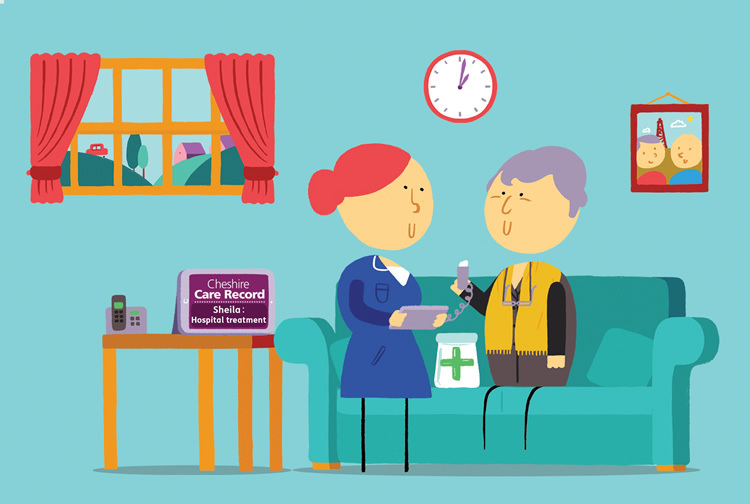 The Cheshire Care Record is a summary care record that gives care providers a quick holistic view of your care from all health and social care services in Cheshire. 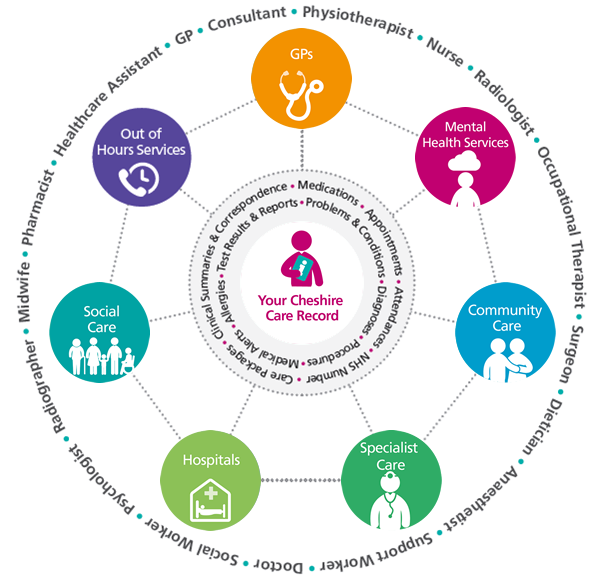 It is a collaboration between GPs, hospitals, community care, mental health and social care services provided across Cheshire to provide health and social care information in one digital record. Your information will only be accessed by health and social care professionals – such as the district nurse involved in your care – if you have given your consent. You will be asked for this consent the first time that a health or social care professional wishes to view your record. We’ve provided a summary of the data provided for the shared record from each contributing partner. With your consent, health professionals will log into a secure system on their computer or tablet and will be able to see your test results, what medication you are on and if you have had any operations or community based treatment recently. Sheila arrived at A&E because her breathing had worsened. 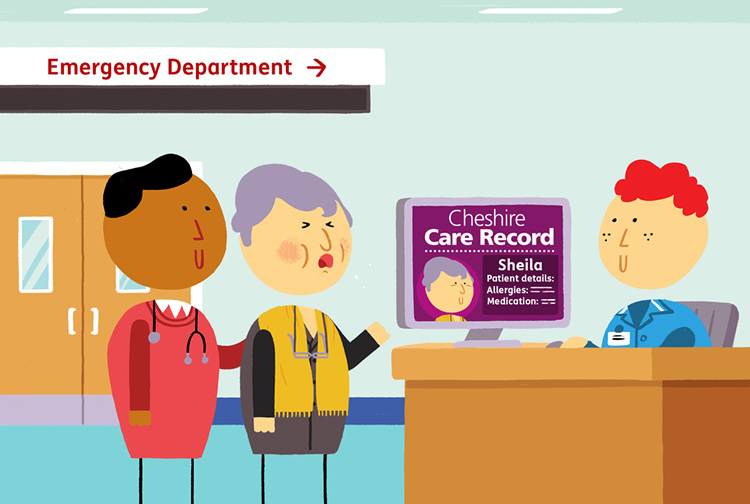 A&E were able to check the patient’s details on the Cheshire Care Record to see her medicines, check for allergies and see the GP’s diagnosis. Sheila stayed in hospital for a few days. Before discharge, the hospital were able to see on the Cheshire Care Record that Sheila had a social care package that needed restarting and this was planned in advance so that discharge was not delayed. On returning home, the community matron visits Sheila to discuss the continuing care support she will need whilst recovering. 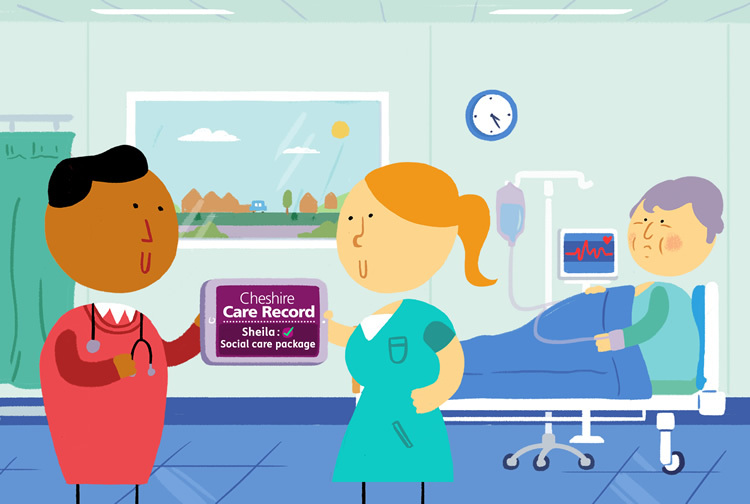 The matron looks at the Cheshire Care Record to get a clear picture of Sheila’s hospital treatment before the visit. Click on each icon to find out more.